Los Islotes is a group of islands in the Sea of Cortez in Baja, Mexico. 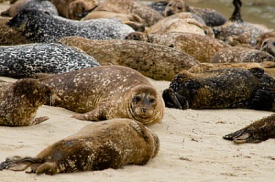 It is famous for the hundreds of California sea lions lounging on the rocks. They are quite playful and will swim and dash past, getting as close as a foot or two away, interacting and playing with tourists. Swimming with the sea lions is the major attraction here, but the islands also offer some great snorkeling and scuba diving sites. Explore the submerged sections of the islands to discover extensive sections of coral and dense schools of fish.